Previous industry experience: Over 30 years experience in the coatings industry. 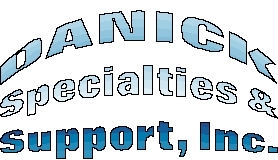 Chuck Danick owns Danick Specialties & Support, a consulting firm based in Niceville, FL. 850/897-3152. He is a polymer scientist, who has been involved in the powder coatings industry for more than 3 decades. He has also held various positions, such as research chemist with Sherwin Williams, formulation chemist at Reliance Powder Products, powder lab manager at H.B. Fuller, senior group leader at Cargill, industry manager with RUCO Polymer, lab manager with Syntech S.p.A., and more recently, as research associate at Eastman Chemical where he was responsible for technical support for powder coating customers in North America. This experience can be categorized as covering the powder coatings business from polymer development to the formulated powder coating. As a member of the Powder Coating Institute, he was chairperson of the Health and Safety Subcommittee for 5 years. Lorraine Danick - With over 10 years experience in Chicago's legal offices, and 5 years association with Carlson Companies in Minnesota, she is an extremely qualified and experienced office manager and assistant to Mr. Chuck Danick. Dr. Paul Pettit is affilated with Danick Specialties and Support Inc. and has been providing consulting services to the coatings industry for the last two years. He has performed services for Powder Technology Inc., EMS Industries and UCB. He was the R&D manager for PPG Powder Coatings, USA. He has authored numerous patents during his career in the coatings industry. The most notable being the application patent for Primid, hydroxyalkylamide. Daniel W. Catena, Before his passing, Daniel W. Catena served as President of Renaissance Technology. Dan had a successful specialty manufacturing business associated with the coatings industry. He was the past President of Syntech Inc./USA. Dr. Elisabetta Oberti, President of Omicron Europa S.p.A. Dr. Oberti and I worked together at Syntech S.p.A. for almost three years and after Syntech was acquired by McWhorter Technologies Inc. for another 2 years. She has extensive knowledge of the coatings industry and is currently running a successful distribution company that sells products to the coatings industry in Europe. Kamlesh Pai Panandiker : Is a retired polymer scientist from McWhorter Technologies Inc. He has known Chuck Danick since 1975 when he first visited him at Reliance Powder Products, Tinley Park, IL to introduce Cargill’s line of polyesters and curatives for powder coatings. He helped recruit Chuck to work with him at Cargill, where they worked together for over 13 years performing R&D for the powder coatings industry. His brother now owns a powder coatings company, Marpol, in Goa ,India.